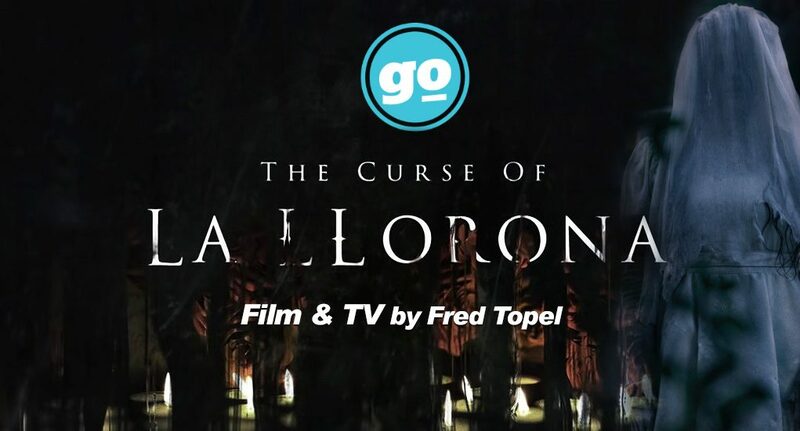 The Curse of La Llorona Interview: Linda Cardellini and Patricia Velazquez - Gonzo Okanagan Online News, Music, Technology, Sports, Film, Arts & Entertainment, Culture, Wine & Dine... Life! The latest film in the Conjuring universe brings an old cultural legend to life. La Llorona (Marisol Ramirez) was a 17th century mother who murdered her own children. Now her spirit comes after children through the ages to punish other mothers. In the film, social worker Anna Tate-Garcia (Linda Cardellini) thinks she’s rescued Patricia Alvarez (Patricia Velazquez)’s children from abuse, but really she’s welcomed La Llorona into her own family. Warner Brothers went all out for the interviews for The Curse of La Llorona. They decorated the backlot to recreate some of the film’s scary locations, like an old garage, creaky house and bathtub where La Llorona draws her greatest strength from water. Gonzo joined reporters in speaking with Cardellini and Velazquez about the horror film, in theaters April 19. MARISOL RAMIREZ as La Llorona in New Line Cinema’s horror film “THE CURSE OF LA LLORONA,” a Warner Bros. Pictures. Photo Credit: Courtesy of Warner Bros. Pictures. © 2019 WARNER BROS. ENTERTAINMENT INC.
Gonzo: Was it very precise and exact choreographing the scary scenes? LC: It was for us, especially because Marisol was with us all the time, who plays La Llorona. She’s such a great actress and wonderful person and what a sport she is, because she has the hardest role of everybody. She’s in a lot of makeup and she’s wet a lot of the time. We’re there for long, long hours shooting with a relatively small budget, this film, that looks like it’s shot for more. It was really important that we were all very close. It was very choreographed at times the way she would grab or not grab and doing scenes where you would see her grab us and we would move, or see us not grab. There’s lots of stunts so it is really a choreography. LC: I know, poor thing, she would come out at lunch with her tray and everything. She was really fun though. She’s great in the movie. (L-r) PATRICIA VELASQUEZ as Patricia Alvarez and LINDA CARDELLINI as Anna Tate-Garcia in New Line Cinema’s horror film “THE CURSE OF LA LLORONA,” a Warner Bros. Pictures release. Courtesy Warner Bros. Pictures. © 2019 WARNER BROS. ENTERTAINMENT INC.
Q: When did you first hear the La Llorona myth? LC: I didn’t know it until I read the script and the script wasn’t titled La Llorona at first so they could keep it secret. So I didn’t know and then after I read it, I asked around and it was like “oh, yeah, yeah, yeah, that’s an old story my grandmother told me” and then I started to learn. It was good for me because my character doesn’t know and that’s what gets her into so much trouble. She has no idea what she’s stepping foot into. So my introduction to it was New Line taking this step. Now I’ll never forget it unfortunately. PV: I grew up with it. I’m Venezuelan but I grew up in Mexico. La Llorona is very real for us. We grow up with her and it’s really how our parents make us do what they want to. There will always be the thing, “You have to come in at 5 because otherwise La Llorona is going to come and get you. Make sure you behave and do what I tell you because otherwise La Llorona will come and get you.” I remember even the place where we lived in Mexico, there was an old casino that was abandoned. I can tell you that we all heard La Llorona. She’s so real to us. She’s not an entity that goes away when you grow older or that stays in Mexico or in Venezuela or in any other hispanic countries. She stays with you. You can talk to any hispanic person here in L.A. and they will tell you, “Oh, my mom heard her” or “I saw her.” I think in terms of the story, it makes absolute sense that Linda’s character doesn’t know about her because if it would’ve been a hispanic character, she would have believed it existed. LC: They would’ve kept them in that closet. (L-r) MARISOL RAMIREZ as La Llorona and ROMAN CHRISTOU as Chris in New Line Cinema’s horror film “THE CURSE OF LA LLORONA,” a Warner Bros. Pictures release. Courtesy Warner Bros. Pictures. © 2019 WARNER BROS. ENTERTAINMENT INC.
Q: What was it like doing the film knowing this your whole life? PV: I felt chosen in a way by her because again, she’s very real. I almost felt like that she had chosen me to make sure that we were respecting her and that the movie would be done with respect. And also because I think I almost felt like she chose me because I understand the pain that she’s going through, she still is going through. Q: What was it like being on set with the embodiment of this legend you knew? PV: This is what’s so great about Marisol. She’s so wonderful as a person, so fun and so loving and the way she connected with the kids, that I almost really had to make an effort at all times to really remember that it was Marisol. But when it came time to work, when you have grown up with an entity that you know that exists that is there and that is watching you, it was very easy to connect with Marisol. Number one, she was doing the great work and number two, you have it in your veins, inside. LC: There’s something too about people being in a certain kind of costume. When Tony’s in the priest costume, there’s a certain reverence that you sort of have when someone dons the collar or if somebody dresses up like something that is imposing. So when Marisol’s in full makeup and doing what she does, it’s easy to jump into believe. (Foreground) ROMAN CHRISTOU as Chris, LINDA CARDELLINI as Anna Tate-Garcia and JAYNEE LYNNE KINCHEN as Samantha and (Background) MARISOL RAMIREZ as La Llorona in New Line Cinema’s horror film “THE CURSE OF LA LLORONA,” a Warner Bros. Pictures release. Courtesy Warner Bros. Pictures. © 2019 WARNER BROS. ENTERTAINMENT INC.
Q: Were you fans of horror before? LC: I grew up loving horror. I took a break from it when I got pregnant. For whatever reason, years ago, it just got into my stomach. My nerves could take less for whatever reason and I’ve just come back to it again. I grew up loving horror and especially the New Line horror movies like Freddy Krueger. They’re so iconic and these are images you can’t forget. Regardless of what you remember about the movie, you can’t forget the idea of someone who haunts your nightmares. So the idea of doing a movie with these guys, especially James Wan and Gary Dauberman and New Line and Warner Brothers, it seemed to me that the people who were doing it in a way that was really fun and had great actors in the films. PV: No, for me, no because I’ve always been very scared of things, believing in La Llorona. This is something that you have in your day to day life that it’s made me somehow somebody that gets scared easily. I have watched horror films, don’t get me wrong, but I didn’t have this thing of wanting to go and see them. After watching the film with an audience the other day, I now am totally hooked and I’m totally a fan of horror, because it is one of the only genres where you can still have a community experience. And there are very few left. There are very few situations where you can have oh my God, oh no, she’s going to do, stop stop stop, oh my God. You become a part of this community and I think we need that. That’s why horror keeps growing and growing so I’m definitely a fan of horror now. Q: Did anything weird happen on the set? LC: Mine happened after but yours happened during. PV: There was definitely an energy on the set. I’ve told this story before. Sometimes we do this little exercise as actors where the day before, you write down on a piece of paper, you write this note right before you go to bed and you say, “Dear inner self. If it is your will, please allow me to see in a dream tonight the struggle of the character Patricia, in this case, so I can get closer to you.” And then you say with love and respect and you sign it and you put a date and you put a time. I went to bed, I’m asleep and then all of a sudden I hear a massive cry, scream. It was a scream with so much pain that it sounded like the most horrible thing I’ve ever heard. I still think about it constantly. When I heard it, I woke up so quick and I screamed the name of my daughter. I went to her room and I hit myself on the door. Then I arrived to the room and I fell on my knee. It was the noise of falling on the wood that woke her up. And she goes, “Mama?” She didn’t even [hear it]. Here I am on the floor kneeling and I’m like, “Are you cold?” I didn’t know what to say. She’s like, “No, mama.” Then I started bleeding on my knee so I go to my room, I sit down, I started cleaning my knee. And then I look and I see the note. I thought oh my God, it was her. Oh my God, it was her. It was so crazy, so weird and so painful that I felt like it was her and I understood her struggle, her pain and then it’s almost like she made it organic. LC: When we were in Austin for SXSW, we were in this old hotel that they said was haunted. That’s where we had this reception. I went to go use the restroom and they put us in this suite that had this beautiful, old clawfoot tub. It was a giant bathroom and I was in there and the lights started flickering. I thought well, that’s weird. So I got out and there were several other people in it. I said, “Did the lights flicker in there for you?” And they said, “No, the lights aren’t flickering at all.” That’s weird, because there’s a huge bathtub scene so while I was in there I was sort of getting creeped out about the bathtub with the clawfoot. So later that night, we went ‘til two in the morning or something like that by the time we came home, and I couldn’t sleep. I was in my room and I heard this terrible slam of a door and I thought okay, I’m in a hotel but that sounded like my hotel room door. So I ran out to see if it was somebody who maybe had come into my room accidentally, maybe somebody who worked in the hotel. I looked out in the hall and there was nobody there. So I turn on all the lights. I didn’t want to go to sleep in the dark, and it was a sliding door, sort of like that barn door between the two rooms. So I left a sliver of it open so that the light could come in, because I was getting a little creeped out even though I don’t believe in that stuff. When I turned around, the door closed. My heart stopped and I thought okay, maybe the hotel is on an angle. I don’t know what is happening. So I opened all the doors and I sat in my bed and through the doors I could see the drapes and I thought I saw the drapes moving. So then I checked the room, I checked every inch of the room because I thought maybe there’s somebody in my room playing a joke on me. There was nobody there but I don’t really have those kinds of experiences and that night in Austin I had several. Isn’t that crazy? 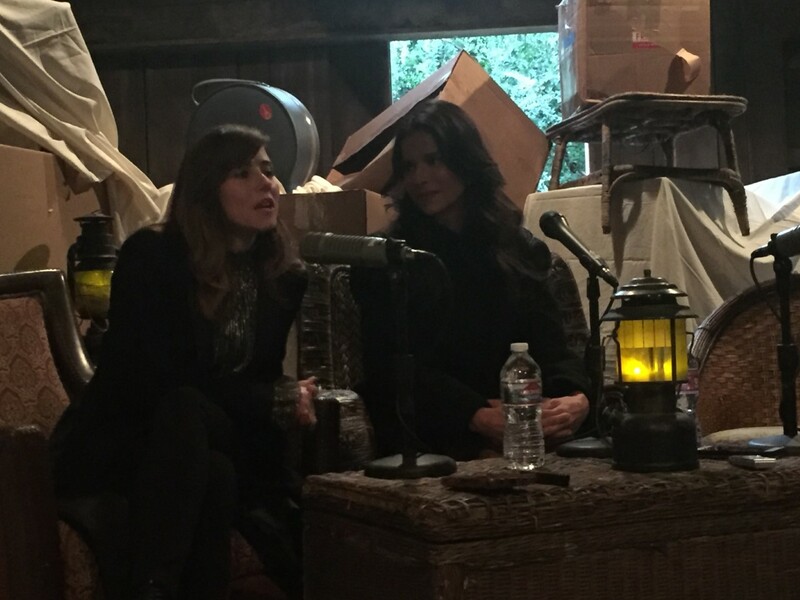 Linda Cardellini and Patricia Velazquez during interview. Photo credit: Fred Topel. Q: It was your closet door that opened? LC: No, they gave me a really nice room that had a sitting area and then a bedroom. They had these two sliding doors on each room so you could partition it. I left it open just that much. When I turned my back it slammed closed. I got so nervous and then I wanted to call everybody but everyone was already asleep. It wasn’t the haunted hotel. It was a different hotel, but she always says La Llorona follows you. So I kept hearing her in my mind thinking she’s following me.